Note: Prescribed barbell weight for men is 135lb. and women 95lb. Each round will be individually timed. The goal is consecutive repetitions at each weightlifting and gymnastics stations. This is a sweet session. Congratulations to Naomi who was recognized as Athlete Of The Week at CrossFit Amundson. Naomi’s performance during the recent CrossFit Open quickly became the stuff of legend, and her stellar technique, stamina and warrior-spirit enabled her to qualify for the next round of CrossFit Games Worldwide Competition. Naomi has nearly 15 years of CrossFit experience to her credit, and was one of the “Founding Members” of the original CrossFit HQ gym. Many of Naomi’s early experiences with CrossFit helped forge the way for now millions of CrossFit Athletes. In addition to her competitive drive in the gym, Naomi has served and protected our community as both a Police Officer with Santa Cruz Police, and now as a Deputy Sheriff with the Santa Cruz County Sheriff’s Office. 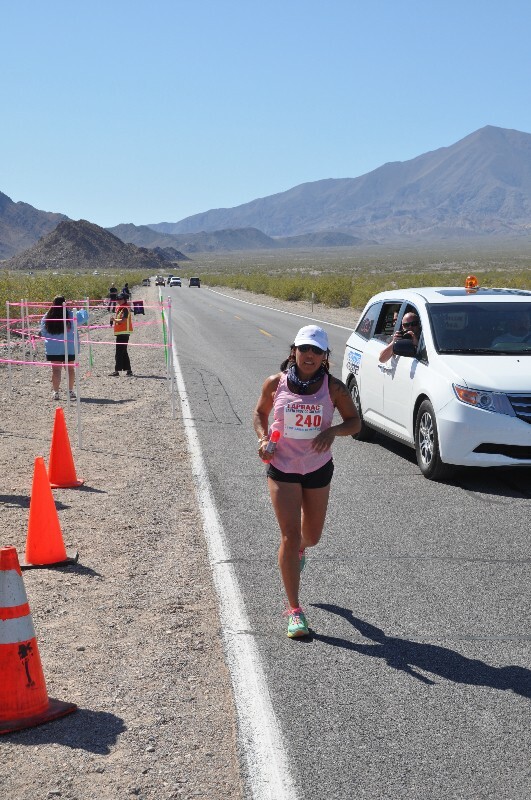 Naomi recently represented the SCSO on the infamous Baker to Vegas relay run (along with Mark) as depicted in the photograph above. Thank you Naomi for being such an inspiration to all of us, and thank you for your service to our community. Note: Complete up to three rounds of this workout. Rest as needed between rounds.